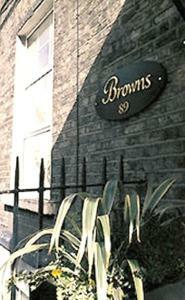 Browns is a three star boutique that was totally renovated in 2001 and offers comfortable accommodation in the heart of Georgian Dublin. It is just two minutes from O'Connell Street the capital's main street and is on the door step of all that Dublin has to offer. You are insured of the lowest internet-rates. But you can pay at the reception of Browns Hotel, Dublin 1. Without reservation costs and at the lowest price! After your reservation you receive a conformation by e-mail. We wish you a pleasant stay at our hotel in Dublin 1.